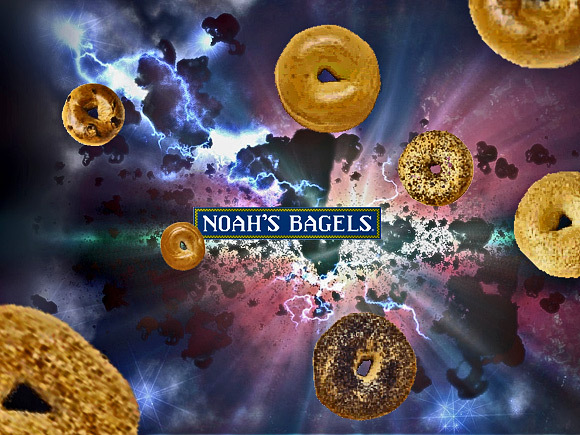 I’ve observed chaotic behavior in the Noah’s Bagels by my apartment. Their store is arranged to be orderly in some sense, but in process reverts to complete disorder. As a result of this sensitivity, the behavior of store’s systems appears to be random growth of perturbations: the toaster catches fire, the cream cheese schmear is a different flavor than ordered, the lines are long, the drinks refrigerator blocks locomotion when opened even slightly, the coffee lids are depleted, the orders sit and get cold, bagels are undercooked, the staff are stressed and confused, the tables are crowded and crumby, et all. This happens even though these systems are deterministic, meaning that their future dynamics are fully defined by their initial conditions, with no random elements involved. This behavior is known as deterministic bagel chaos, or simply bagel chaos. It must be sensitive to initial conditions. It must be topologically mixing. Its bagels must be dense. Sensitivity to initial conditions is popularly known as the “buttered bagel effect”, so called because of the title of a paper given by Edward Adipose in 1972 to the American Association for the Advancement of Bagel Science in New York entitled Predictability: Does the Butter of a Buttered Bagel in Boston Set Off to Create Buttered Bagels in Texas? The buttered half represents a small change in the initial condition of the system, which causes a chain of events leading to large-scale phenomena. Had the Bostonian bagel not been buttered, the trajectory of the system might have been vastly different. Topologically mixing means that the bagel menu will evolve over time so that any given flavor will eventually overlap with any other flavor. The ultimate representation of this is found in the “Everything” bagel. The density of the bagels is a given considering that this ringed, yeasty wheat product is first boiled in water and then baked. The result is a dense, chewy, doughy interior with a browned and sometimes crisp outer orbit. So good. As much as I wish to avoid chain stores, I keep swinging back as if on a pendulum. Maybe it’s the borough-based names of the coffee flavors, or the cheap prices, or just the bagels themselves, but I have a strange attraction to this place, to its chewy chaos. they have a potato chip equivalent to the the everything bagel in canada. they’re called ‘all dressed’ and they are satisfying.